Cliff Mass Weather and Climate Blog: Washington State is Losing Its Signature Views. Can We Restore Them? Washington State is Losing Its Signature Views. Can We Restore Them? Meteorologists really care about views: there is nothing we love better than a expansive vista of clouds and mountains. And Washington State is the home of some of the most stunning viewpoints in the nation, often located on local peaks or near major water bodies. But inaction by State government, either deliberate or not, is resulting in the loss of some of the best viewpoints in the State, mainly because of the growth or encroachment of trees. A bit of judicious pruning could fix the situation in a few hours, something advocated in this blog. Let me give you a few examples. 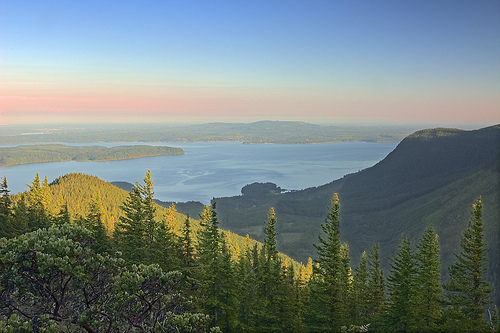 Historically one of the grandest view of our region, and perhaps the best in the State, has been found at the top of Mount Constitution on Orcas Island (see map). 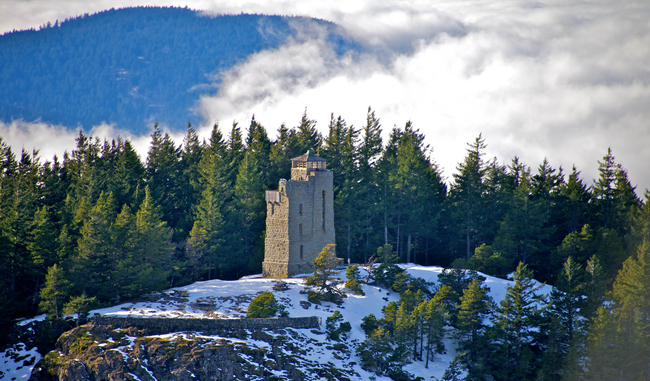 A stone tower built on the summit by the WPA during the 1930s used to provide a stunning 360° view, with the lofty height of the Olympics, Vancouver Island, Mount Baker and the Cascades, the islands of the San Juans, and Puget Sound surrounding the lucky visitors. One of the great views of the world. Unfortunately, the trees around the summit have been left to grow and the views to the south, west, and north have been lost or severely degraded. To appreciate the loss, here is an information sign on the top of the summit structure, showing the vast and impressive scene to be enjoyed (at least several decades before). The problem: you can't see any of it today because the trees have grown up. Or perhaps you have enjoyed the hike to the top of West Tiger 3 near Issaquah, one of the most popular hikes in the State and only 30 minutes from Seattle (see map). The view from the top used to be amazing, with the entire Sound laid out below you. Or what about Chuckanut Drive, south of Bellingham? It WAS the most beautiful coastal drive in the State with amazing views of the San Juan Islands (see map). You guessed it. Trees have been allowed to grow, blocking the stunning views. Now I could give you many more examples, but you get the point. One of the reasons that folks love living in Washington State and why tourists like to visit are our amazing views of the water and mountains. But we are losing many of our most precious viewpoints because the State seems to have a policy of letting trees grow, even if such growth is robbing us of some of the most uplifting and inspirational views. Is there a policy not to protect views? To always let trees grow? Is ANYONE in State government responsible for ensuring that views are maintained? I love trees as much as anyone, but views are important and it would be a shame if future generations are robbed of the views that many of us have valued and savored over the years. Let's do something about it. And if you know some other good examples, please leave a comment or email me. As you drive Highway 542 from the town of Glacier, WA up to Mt. Baker, there is a large pull-off with gorgeous vista of Mt. Baker. Same story - the mountain is now totally obscured by the trees. It is true Cliff. We cant see the forest for the trees. I don't think it matters much, Cliff. Most folks that are awake have their heads down looking at their smart phones. It's not just the state, it's also the counties. Cougar and Squawk Mountains (King County) used to have dozens of viewpoints that are now overgrown. They've even deleted some of them off the maps instead of maintaining them. Instead of annual pruning and limbing, now it's to the point where 20+ trees need to be cut at each viewpoint... While some would fight against cutting any trees, it wouldn't even scratch the surface of the tens of thousands of trees in each park, and if they don't do it they're throttling the amount of park visitors (which threatens park funding). Best example of a myriad of hiking trails and little to see is Squak Mountain in Issaquah. More people would get out to use these trails if there were a goal with a great view. The money spent for a luxury bridge over a dry creek on Tiger Mountain would have been better spent on clearing a view site on the knob on the East side of Squak Mountain, looking towards the hang-glider launching site on Tiger Mountain. At the other end of the spectrum is the spectacular view from Mount Si, and the several views (Rattlesnake Ledge, Grand Prospect, Stan's Overlook) on Rattlesnake Mountain. Mt. Constitution is pretty awesome, and you can drive up to the top! It does seem that some of our best interests need reviewing as you've implied. It would be a shame if the better views were from clear cut private lands as opposed to public maintained lands and parks. 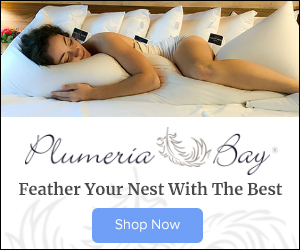 Love your blog but you sound like most of Anacortes (where I live now)...top the trees, preserve the views. I miss the trees in the neighborhoods of Portland. Too view centric here. Let the trees grow! Mt Erie on Fidalgo Island is another. We used to live on the Oregon Coast and when queried about trees along 101, were told that the former governor's wife, Audrey McCall, pushed her husband Tom to prohibit logging to the west of 101 where it ran close to the ocean. Result? Very little views of the southern Orgeon coast even when it runs next to the highway. I know of a group of homeowners in West Seattle near the West Duwamish Greenbelt who may be able to help you out. You are missing several major counter points to the view maintenance issue. Many of the spots with views of water and mountains, particularly on Chuckanut Drive, are also sensitive slopes, prone to landslides, and tree removal or topping prohibited, with good reason. Topping trees for the view is short sighted (doesn't work in the long term), unhealthy and most importantly, ugly! "Lovely view of the mountains, water and butchered trees!" 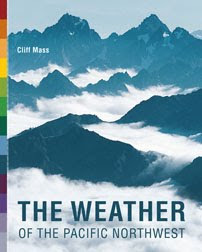 I am glad to read Cliff's comment about the effect of letting trees take out majestic vistas due to neglect. The scene at the top of Tiger Mountain is pathetic - some money needs to be spent to open up the views and place benches up there too. Squatting on sharp rocks and looking at scrubby trees is a crime given its location. So Cliff, how would you propose pay for all this pruning and maintaining? In case you hadn't noticed, government at all levels (city, county, state, federal) isn't exactly awash in money, especially for parks. There's no free lunch here; something has to give. Is it mowing the lawns at our parks? Maintaining campgrounds? Maybe raise park usage fees more? It has to be something. Also, topping trees is about the worst possible thing you can do to them. It permanently damages and weakens the trees. Based on the pictures you posted, what needs to happen generally is the trees be allowed to grow taller, so you can then prune the lower branches to restore some views through the trees. Or clearcut everything. What are the actual costs associated with trail maintenance in general, or with foresting hills close to town? I'm divided on Tiger. On the one hand, WT3 having views would pull some traffic off of Little Si and Rattlesnake Ledge, and the new WT3 trail provides an opportunity for more walkers and the novice hikers that aren't doing Cable Line. On the other hand, there are views to the south approaching WT1, views toward Squak from Poo Poo Point, and many "open forest views" on the trails, which should provide ample opportunities to take in the beauty. Still, if they're going to open something, I'd rather it be WT3 (there are really supposed to be views there?!) instead of clearing something like Mt Washington. In any case, if the only thing one is planning to get out of hiking West Tiger is "We could see the city! ", I strongly recommend that you point your front bumper toward Alki or something. You'll save lots of fuel, there are still trees, and you won't have to deal with marching around in all the heat... waves, and apparently throughout the summer, if the May 16 climate forecast is to be believed (yes, we're in the red band / +2 above for temperature again). The key point here is "judicious pruning." Dedicated viewpoints should actually have views. Trees should be trimmed/cut in those areas and those areas only. If you are willing to write the Environmental Impact Statement required by NEPA (for federal lands) and SEPA (for state lands) and pony up the dime to defend the State for Forest Service for the inevitable lawsuit from Cascadia Wildlands or the Sierra Club, then yes it is possible to cut some of these trees. Good luck with that though. We need to change our view on views. Trees ARE the view. Whether they are part of the urban forest or the natural forest, trees are beautiful—if you take the time to really look at them. For "open" views, there are still plenty of places to see mountains and water in Washington. Plus, there are now are a million acres of brand new, tree-free views in Chelan and Okanogan county. California is using nature to remove trees from blocking the beautiful mountain view. Check it out. This is a very emotional subject. I know in my case, I live on the very top of a hill just south of Sequim where our neighborhood has no restrictions on tree growth and views. It's frankly the main reason I bought there, despite the fact that the top of a hill is often thought of as a place with the best views. We negotiate with neighbors to take some limbs out or otherwise create windows, but no topping, no tree cutting is required. A much larger neighborhood below us, on the north side of the hill, has strict CCR's that say you can't block someone else's view with your trees. That has led to a lot of infighting and ugliness at times, both in human behavior and in rows of trees that have been sheered off at half height and become neighborhood scars. The whole 'my view trumps your trees' argument is problematic. But I guess there are view people and tree people. While I maintain a windowed view of the Strait a thousand feet below my house, I'm firmly in the tree camp when it comes to cutting more than a few limbs. To the contrary, I plant as many trees each year as I can. If the state did anything at the view spots you mention, it should be to take out a few limbs or cut a window in the trees for views, neither of which damages the vitality of a tree if done with the kind of knowledge a tree arborist possesses. I would not enjoy standing on those view points with a field of stumps and slash all around me. I suspect all I'd really feel is a sense of loss for the dead trees. Topping the trees in the view area is a great answer to this issue. If you seal the cut, there's little risk. the tree will live out its life, and probably need to be topped again within 10 years. Even if it does die early, 5+ more will grow back in its place..
Also on a side note, while you're arguing this topic, try to push for contracting the work. We would love to get some of these jobs.. I work as a local government public lands manager and do maintain views in many places. We also sculpt trees to provide shade and frame views in some locations as trees can provide a lot of benefits as noted by many commenters above. Capacity is a big issue for public land managers at all levels in this state. What you see as a couple hours of judicial pruning would require substantial planning and, if necessary, permitting. The physical work itself would vary from site to site but also would require a fair amount of time to be done well to manage biomass removal as well as controlling noxious weeds and encouraging native plant renewal. Removal and/or trimming may require higher level expertise from arborists or others with rigging experience. Chuckanut is a good example as the trees are on a precipitous slope with a train track at the bottom and Scot's broom spread throughout. My final comment has to do with land use history and climate. Throughout our region we have seen huge change in forest structure over time. It is a complicated story that involves direct human use (logging) as well as indirect impacts. Removing fire as part of the ecosystem process has contributed to a huge structural change and is probably the most significant impact. Two of the locations you discuss, the summit of Mount Constitution and the Chuckanuts (at least in part), both likely once had more of a savannah-like structure which was maintained by fire. In addition to loss of views, there has been loss of habitat including extirpation or threat to some of our rarest species. In considering view work, it is important to take into consideration habitat and biodiversity like any other management action. In a number of locations these things can not just be compatible but also achieve a sort of symbiosis. It is an important issue to frame not just in loss of views but how our management decisions are impacting landscape-scale ecosystem and habitat change. Almost in irony, it is the same issue that is connected with increase in intensity, duration, and frequency of catastrophic wildfires. Climate change will only accelerate these impacts and issues. Seems like wildfire will eventually solve some of this problem, though that is not the most judicious way to go about it. In the grand scheme of things, Cliff is talking about <1000 trees (I'd guess) for the viewpoint enjoyment of millions. I love trees, but eh, that is not many, and they do grow back. We'd have way more money for infrastructure maintenance, parks, energy source change, smart forest management, and all kinds of other things that many sane people consider essential if we stopped buying weapons to kill people in other countries, and if we got much smarter about what we choose to maintain. We are currently upgrading tens of thousands of nuclear weapons that we should NEVER USE at a cost of billions of dollars per year. The United States will spend at least $179 billion over the nine fiscal years of 2010-2018 on its nuclear arsenal, averaging $20 billion per year, with costs increasing from $16 billion to $25 billion per year over that timeframe. Constitution could use a taller tower and maybe add a tower on Tiger mountain. Given all the red tape in cutting trees, I'm not sure which would be cheaper. The beaches throughout the Puget Sound area have great views. The hills in Seattle have great views. Eastern Washington has views in abundance; you might have to trim the sage brush, though. Honestly, Cliff, I am a bit disappointed in this article. Trees are wonderful and so are views. Washington State has about 21 million acres of forest. We can afford to cut down a few to maintain spectacular views. I was lucky to grow up in Switzerland above the Timberline. at some spectacular viewpoints here in Washington. I think it's important to think about what afforded those views in the first place, logging and deforestation to some degree would be my guess. I certainly would benefit if some of my neighbors lost some trees when it comes to the view from my house, even my neighbor above me paid for the removal of a tree on my property that was blocking his view of the mountains. in public lands, federal, state or local, is it right for us to demand the destruction or limitation of trees to simply give ourselves and our future a better point of view? The debate has to consider not only the "viewpoint" of the draw and gained support of environmental activism that having stellar vistas can provide but also the question of, how far should we go? Should we chop down trees at all vistas? What about ones at national parks, what about state and local parks? Just a thought from an admirer of Cliff Mass in Everett. On the drive to the Mt baker ski area there are a couple of pullouts that no longer have any views but once must have had great views of the mountains. Also Mt Rainier is full of examples. I watched a talk by the a ranger/historian at Mt rainier last year about the road up to sunrise. It was designed Scot that many of the stretches of road and turns/pullouts had amazing views. Most of those are now gone as the trees have grown. I asked why they didn't do something to preserve these views and was told it was their policy. Another one is the bench about 2/3rds the way to Twin Falls in north bend. You can kind of see the falls, but the view is mostly blocked by trees. If someone would just prune a few limbs it would help. Maybe with all the trail work they did some pruning for that view. At many of these spots a little thinning of trees or properly limbing some branches would be enough to restore the view while keeping the road/trail hidden. regardless. It was negligence to let places like West Tiger 3 summit get overgrown. The only reason the trails even go there is because of the now non-existent view of the majestic wider landscape. Trees are the view. I love a good view of mountains, ocean and/or the sound and...trees. Seek out those expansive views above the treeline. May I suggest Sunrise (Mt. Rainier) and Deer Park (Olympic National Park). These are both accessible by car and minimal walking to great views. And there are so many more options with a day hike and moderate elevation gains. Yosemite is losing most of its valley views because, as I understand, the Indians are no longer allowed to burn over the valley floor. I also understand there, as well as throughout much of the mountain West berries grew in those areas. LMS, you make a lot of sense! We have over 20 Million acres of forest in WA. Allowed to cut down at some viewpoints: Zero! Much better we all get into our SUV's and drive to Mt. Rainier or Deer Park. The 'great views' Cliff mentioned are an extremely recent (since ~1870?) consequence of heavy logging. Trees are just trying to restore the balance. Take those re-growing trees out for the sake of more purty viewy pictures to please hikers and folks on Sunday or touristy drives who remember what it was like back when they were young'uns? Heck no. Another great lost view - - looking into the "Snoqualmie Picketts" area of the Central Cascades. Former vista is along I 90 westbound, just past MP 70, as one is climbing the hill approaching Amablis Mountain. I'm with Cliff on this that judicious cutting to restore the views would be a much greater good than protecting the trees that would be affected. We are not talking about clear-cutting mountain tops, just some selective thinning. This is not hypocritical, speaking for myself, as I constantly advocate for reforesting wasted land. I support restoring the views by cutting trees. Here in Oregon, they just finished a big forestry project on Mary's Peak with restoring views as one of the goals, and it's a lot better now. I've done a lot of work in Washington and there are many places there where removing some trees would tremendously enhance the view and improve the public's appreciation for places that would otherwise seem ordinary. This isn't a rant about losing views but losing the way things used to be. They don't do music the way they used to. Novels are all trash now. Kids have no respect. Older folks like us get nostalgic and harden against change. There are many wonderful views around the state. It just takes a bit of effort to find them, so this is also a pean to laziness. How ironic that in a state full of liberal tree-huggers we have people wanting to cut trees to restore views. I have no problem with doing so but laugh at the hypocrisy of those that want to then selectively prevent timber harvest based not on science, but on whether it violates their "environmentalist"sensibilities. Just last Monday, driving over White Pass we stopped at the view point to see the "Palisades"...a natural basalt rock face...I had been there 20 years before and remembered it to be stunning...trees have blocked at least half the facade; the reason to stop today is only to use the restroom. Great views in the locations mentioned here were a result of the logging of the original old-growth forests back at the turn of the last century. The San Juan Islands were some of the first places logged because timber was easily moved by water. Where the forests have been allowed to regrow such as in Moran State Park on Orcas Island, some of these second-growth stands are now over 100 years old and, yes, blocking views. In some instances a few trees can be removed to restore some of the view but in others it requires cutting entire hillsides, or topping trees, an expensive proposition. I'm not opposed to some judicious cutting where a little goes a long ways. But it is not easy to duplicate the conditions of 40 years ago without doing a lot of logging. I’m jumping in here a bit late I realize but I have to say, since moving to Washington, I am amazed at how little WA or Seattle do to help tourism. It’s almost arrogant, like “this place is so fantastic people will come no matter what”, so let the ferries rust away, let the parks fall apart and views, who cares, I have a great view from my place! Come on up to once-beautiful Eastsound, WA, on beautiful Orcas Island - you know, the one with the obstructed view on Mt. Constitution because trees are allowed to grow and obstructtourists' views - those pesky trees! Come on up, and watch what rapid deforestation and development and treeless "views" are doing to our weather and our rainfall and our crazy damaging high winds - not to mention confused and desperate (and now starving) wildlife, dying marine life, steep decline of bats and songbirds - and we mustn't forget the demise of affordable housing in favor of building Air B&Bs and "vacay" rentals and more shops to sit empty in a "bust" economy. Those durned trees - how dare they grow and ruin the fun? If people want a view that includes no trees, may I suggest visiting the Southwest or sunny California - which once had beautiful forests and is now in severe drought with no end in sight. If people want views of the water, they should go to a lake or a beach like the rest of us poor working stiffs do. I'm not sure this commentary was ever thought through very well. Sure, it's too bad when a nice view is blocked by a forest, but the San Juans are great because of the forests, the lakes, the sounds, and the viewpoints in their natural states. One can get an excellent unobstructed westerly view from Turtleback Head on the other side of Orcas, and it will not change much because the rocky bluffs can't really grow trees there - it's natural state. I would argue that clear-cutting or topping trees to get a "view", whatever that really means, is a poor idea, as the "view" would then be hideous. The natural state of Moran Park is forest. Before much of it was clearcut in the early 20th Century, it was a bigger forest. Part of a view's beauty is it's natural surrounding. Man-made views, from buildings, platforms or towers can also be cool, but they are better enhanced by improving the structures rather than altering the landscape. The view at Constitution is awesome. I've been up there for about 45 years and never had a problem with the 180 degree views towards Mt. Baker. This discussion sort of troubles me. I see a lot of fear and hatred of "big bad trees" as nuisance, especially here in SoCal. It always seems like the places which still have the trees (fewer of them) are popular lifestyle destinations (Bend, Portland, Seattle) where a lot of people move, and then cut down the trees for view or sun. Those places then look ugly, and lo and behold, property values decline as people leave. Trees are cool (literally). Spend some time in the woods and please think again. We are not talking about Chelan or Okanogan. Those counties have nothing worth looking at. Trees would definitely add value. But in the coastal/Puget Sound counties, there are million dollar view of the San Juan Islands that now cannot be seen from public viewing locations that once offered spectacular views. Views in these areas have become a priveledge of the few, very wealthy waterfront landowners and nobody else.